In life you will often find people’s opinions split right down the middle on certain subjects, with each side defending their opinion passionately. Things like how to make a cup of tea, Apple or Android, Dogs or cats are all great examples. Heck there are even enough people in South-Africa that think those inedible, cheese-covered discs in a giant box from Roman’s are Pizzas. FIFA or PES has become one of those types of arguments. The reality is that if you enjoy FIFA there is not much PES can do to change your mind. Konami just need to make sure they are at the top of their game when EA slips up or when someone is brave enough to take the plunge and discover something else. If that year was 2017 would the new PES be good enough to make those who try it for the first time change their mind? Gameplay has always been the cornerstone of Pro Evo’s success, and over the past few years that has been no different. Konami has slowly been coming to terms with the Fox Engine and have improved year-on-year since it released. What they have managed to do with the engine this year, has in my opinion, resulted in the best football experience I have ever had in a digital football game. The beautiful game is a sport filled with many micro battles. Can the quick attacker turn the strong defender? Can the playmaker thread an eye of the needle pass through a tight defence? Can the defender use his body and anticipation to outmuscle an attacker? Can the goal keeper get his finger tips to a perfectly struck free kick? I’m happy to say that all of these little battles play out extremely well in PES 2017. The major change that makes all of these very different battles play out is the new collision system in the Fox Engine. The ball feels like a completely separate entity to the players, it never seemed to be sucked on to a player because they were near the ball. This makes the tackle area scrappier, much like it is in real life. This enables stronger players to be able to effectively use their strength to shield balls or to ease other players off the ball – and also make executing a perfectly timed tackle much more rewarding. I know what you are thinking, “Great now everyone will just fill their team with the strongest players because they are unstoppable!” Thankfully I can say this is not the case, the fluidity, 360 degree range of movement and new first touch system provides all the tools to be able to get around a defender or find some space to execute the perfect pass. The passing is once again crisp, and the ball physics have been improved particularly when completing aerial cross field balls. You still get the option to change what type of through balls you would like: from assisted settings to fully manual passing. After creating all that space and getting past opposition players we move into the business end of the pitch: time for some goal mouth action. Konami have definitively worked on the shooting, and shots on goal definitely seem more realistic than before. The collision system also plays a part here. Trying to get off a perfect shot while under pressure from opposition is a rare event, making finding space and putting a bulge in the old onion bag all the more rewarding. Trying to stop you from scoring is obviously the opposition goalkeeper, but this year goalies have been the focus of possibly Konami’s biggest change. Animations and goalie reactions have been completely overhauled. Many a time I was amazed at the stops they managed to make, how quickly they reacted to rebounded shots and made second saves. Even though there has been a great improvement they are still prone to those clangers, but at least those clangers look like the ones keepers make in real life. Keeping watch over all the action on the pitch is the referee. In last year’s PES you could have easily thought the ref was absent because you basically had to chop somebody down at the knee for a foul to be blown. Thankfully this has been greatly improved and fouls are blown and cards handed out much more readily and the game has the feel of a proper game of football. The collision system also makes the fouls look far more realistic. 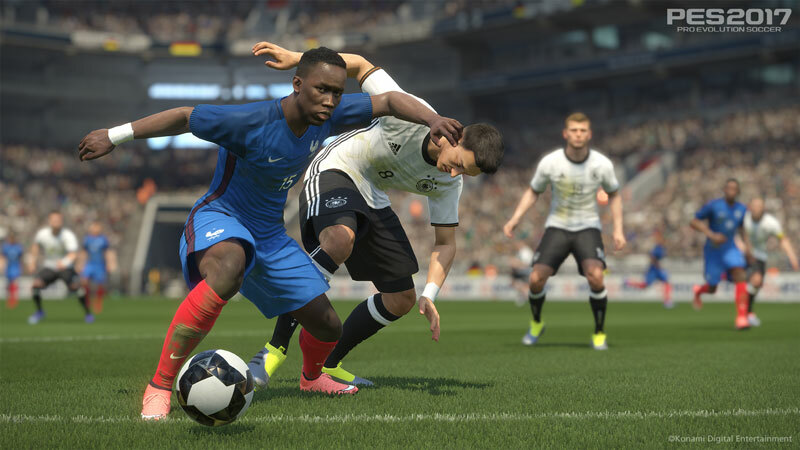 Another facet of the game where PES has traditionally been strong is match tactics. Over the past few years series acolytes have felt like the tactical options available have been slightly dumbed down. Fans of the tactical side of things will be happy to know that advanced strategies can be turned on and off by the touch of a button just like in the PES glory days in the mid-2000s. A timely activation of a couple tactics could see your team definitively outplaying their opponents – as in my experience find your master league team badly exposed. Speaking of Master League, the once king of single player football experiences has seen some welcome changes. The transfer system has had some welcomed tweaks. You now have separate budgets for transfer fees and wages. An element of time has been added to negotiation periods which is a huge plus to deadline day moves. Team roles which first appeared last year have had some more roles added. Training has been improved, and you are now also able to train players to play in a different position. These are all very welcome improvements but I still believe a complete rework of this mode will need to be done in the future to return it to its glory days. All the other usual suspects like cup and league modes make a return, as well as the official licensed UEFA Champions League, UEFA Europa league, AFC Champions League and Copa Libertadores make a return. The elephant in PES’s room, as always, is presentation and licencing. If you are the type of person who values team licenses over everything else in the game nothing said here will ever change your mind. Konami will never be able to compete with the behemoth that is EA in the licencing department, but have done well to set up official partnerships with a few teams. These partnerships will give you a bit more than just a licensed Kit. Barcelona, one of the official partners, has their team song in the game as well as the best looking Nou Camp I have ever seen in a video game. The other two teams that are official partners are Liverpool and Borussia Dortmund. These are not the only licenses in the game though, there are a good number of other licenses to be found. Graphically the game looks amazing and player likeness are remarkable. Certain players even move like their real-life counterparts, they aren’t just a default model that moves like everyone else. Konami has done a great many fantastic things in PES 2017 but there are a few nasties too. Volleys look fantastic, and are all sweetly hit. My gripe with them is that almost all players can hit amazing volleys and it happens way too often. The same can be said for overhead kicks. The frequency with which they occur is way too high. For all the attention to detail Konami pays in certain areas, the lack of attention to detail in certain areas is an annoyance and is something they will need to sort out if they ever want to truly challenge EA for the football crown. There will be a day one patch this year for squad updates which is a non-negotiable. Sadly the game ships with not a single updated squad, so if you are the one in a million who play without an internet connection it’s old squads for you. That it ships with completely outdated squads is almost unacceptable though, as some of these transfers were done during last seasons, others right at the end of last season almost 3 months ago. Even the lack of attention payed to international teams is disappointing. South-Africa for instance has a red or white kit. Even if they aren’t officially licensed surely you know that South Africa has never, ever played in red? Surely one person could be dedicated to check that kit colours are similar and that squads are not completely out of date? Luckily these issue are minor in the grand scheme of things, although they are slightly more glaring when you realise how good PES 2017 could actually be. Disclaimer: at time of writing, European servers for the game were not yet online, so the review is based on the merits of its single player, local play and its AI. We’ve not touched the MyClub features or PES 2017’s online component. But presuming it’s not completely broken, it’ll have no bearing on score. We will, however, update this review once we’re able to give the online a go. PES 2017 is a fantastic representation of the beautiful game. You could play this game for months on end and still find new ways to beat opponents while being amazed at what you just saw. Those who are brave enough to swim against the FIFA stream will be rewarded with arguably the best football video games to date. Previous article Fox producing Stan Lee biopic… as a 1970's action adventure movie? !